Cloth diapers 101. Why we chose to cloth diaper our baby, benefits of cloth diaperings plus best cloth diapers for boys! Not your grandma’s cloth diapers, these new kids on the block cloth diapers are crazy simple to use, stylish, good for the environment, and can save some major cash!! New parents or parents to be, get inspired to jump on the cloth diapering train. 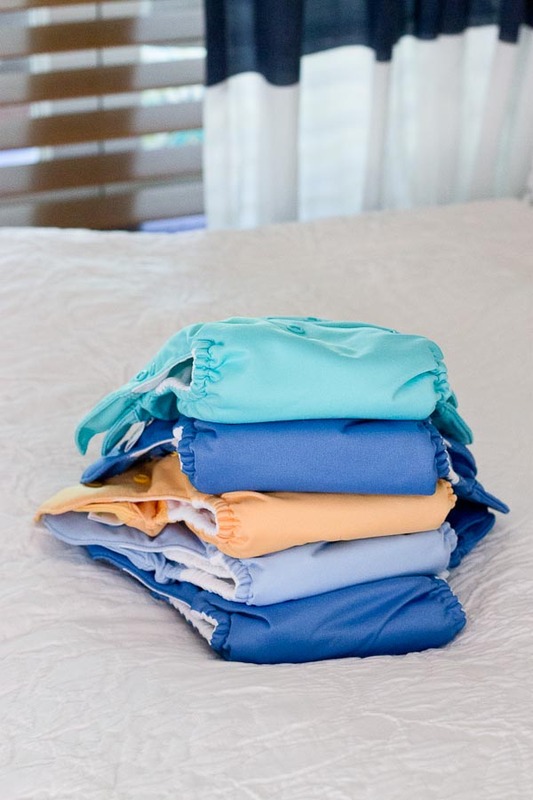 How to use cloth diapers explained and a streamlined process that will simplify your life. 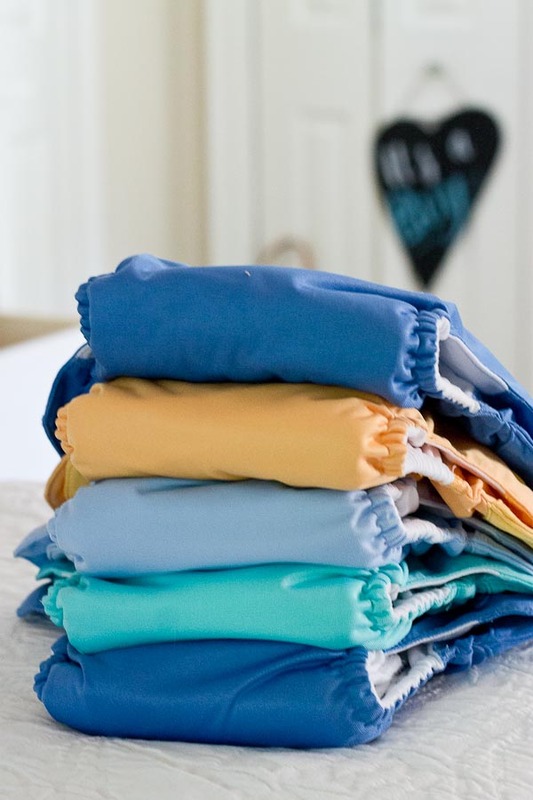 This blog post is something that falls into the “life” category that I feel like is worth sharing for the moms out there curious about cloth diapering. 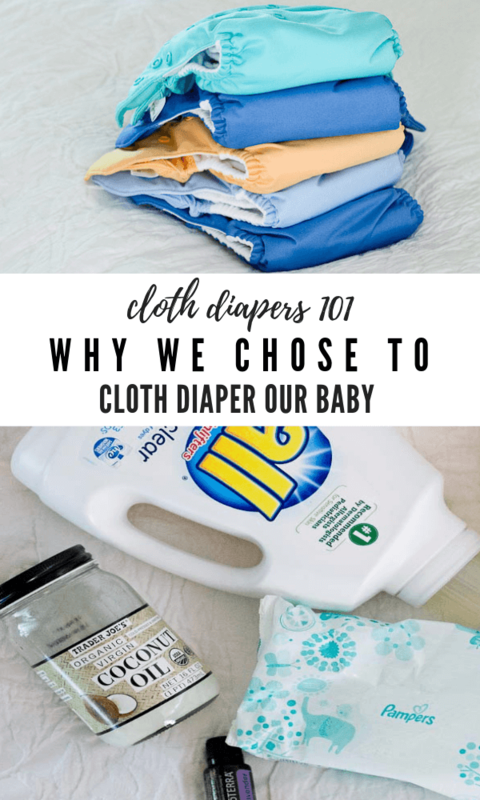 We’ve received lots of questions from friends, family, and readers curious about my experience with cloth diapering, our process, and reasons for choosing cloth over disposables for our little one so I figured I’d just write it up in a post to share my thoughts. I’m mostly writing this post for those of you that may be on the fence and want more info about cloth like I was searching for when I was pregnant, with hopes that it will give you that little nudge to give it a try. Cloth is so easy and really not a big deal. I know, crazy right? Are cloth diapers cheaper than disposable? Before I begin, let’s step back. Eric and I are like in a major way trying to knock out debt from law school. It’s like legit expensive to go to law school (or any professional school for that matter), so we’re always trying to find ways to get debt free faster. As we embarked on parenthood, we looked into some of our projected expenses. I feel like I’m somewhat of a minimalist in that I didn’t want to have a lot of excess “stuff” for our baby but DIAPERS are a big necessity. After crunching the numbers and doing the math, it was looking like we were going to be spending nearly $1000 per year on diapers if we chose disposables. We have friends that chose to do cloth and loved it so I explored more to figure out if it could be a fit for us. 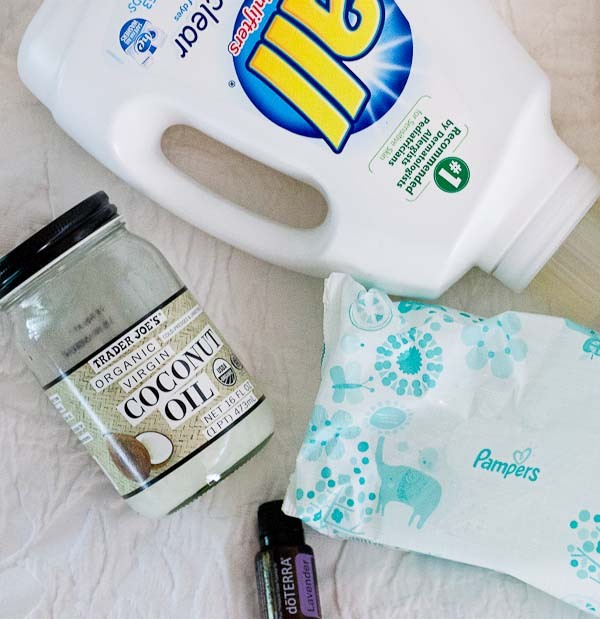 When we got pretty serious about it, we brought dinner over to one of our close friends’ house to get the down low on cloth diapering, and since they both work outside the home, mindful of finances, and run a pretty busy lifestyle we trusted their opinions and expertise. I’m like if they can make it work and simplify their process for us so it doesn’t seem like a big deal, I think we’re in… Eric was still a bit reluctant but he was on board to give it a try because of the cost savings. Heck, if we didn’t like it we could always sell the diapers. Cost savings. We spent about $225 on a set of 15 cloth diapers and that’s more than enough to cloth diaper 1 child. Yep, that’s a HUGE savings when you look at most babies are in diapers for over 2+ years. Plus we are planning on having more than one kiddo that will be able to wear the same cloth diapers that we bought for our first. We were also blessed with lots of gift cards from friends and family– so we were able to purchase most of our diapers that way. I bought most of our diapers with a $5 off or 20% off coupon from BuyBuyBaby. Cuteness, yes truly… there’s nothing cuter than a little cloth diaper bum. For us, “going green” was an added benefit of cloth. Now I do feel good that we aren’t piling diapers in a landfill. 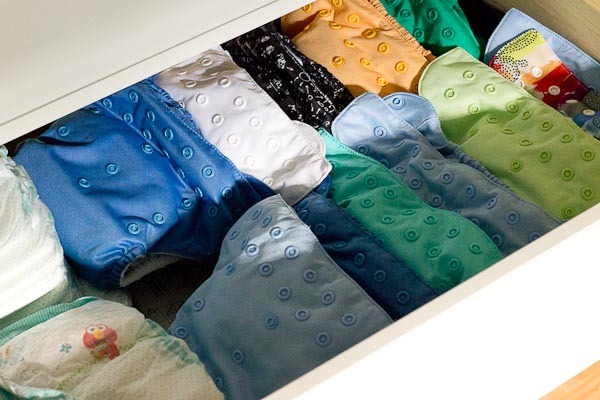 There are lots of cloth diaper options but for our family I wanted simple and minimal handling of dirty diapers so we chose to go with the “All in One” style cloth diapers from BumGenius with snap closures. These diapers are just like regular disposable diapers except they have snaps for closures. They also are one size and can be adjusted with snaps to fit baby as they grow. All wet and dirty diapers go straight into the dry diaper pail… yep, that’s it, just what you’d do if you had disposables. We are exclusively breast fed now so all soils are water soluble. It’s so so easy, its a no brainer. Once baby easts more solid foods, it’s important to dump waste in the toilet. This isn’t that gross– just toss it in and flush, and then put in dirty diaper pail. Every night, or every other night I’ll wash the cloth diapers. Just depending on where my stash is for the next day. HOT water WASH with a detergent free of dyes and additives. They do make special detergents for cloth but I’ve had good luck with “All Free and Clear” detergent. HANG TO DRY. After the diapers go through the hot wash, I just hand them to dry. They take a good 12 hours to dry fully. How to cloth diaper at night? A tip we learned from our friends is to use disposable “Overnight” Diapers at night. While you can add extra absorbent cloths into the All in One diapers for overnight protection, we just haven’t done it. At about 4 months we started using disposables and are glad we did. Travel: You may be wondering what we do when we are away from the house? If I’m only out for a few hours, I’ll carry a wet bag in the diaper bag and just stash wet diapers. If we’re gone for longer or on a trip that we won’t have a washing machine, we will use disposables. 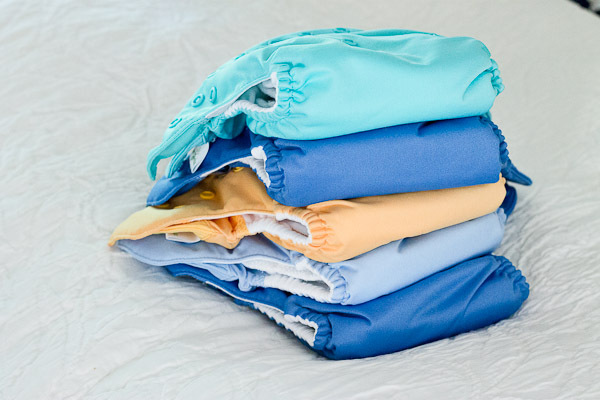 Cloth diapering doesn’t have to be all or nothing to get the benefits of using cloth. Frequency: While every baby is different, most soils only happen once a day or every other day. Most diapers will just be wet. We started out with a set of 15 all in one cloth diapers and added more as I found cute colors. 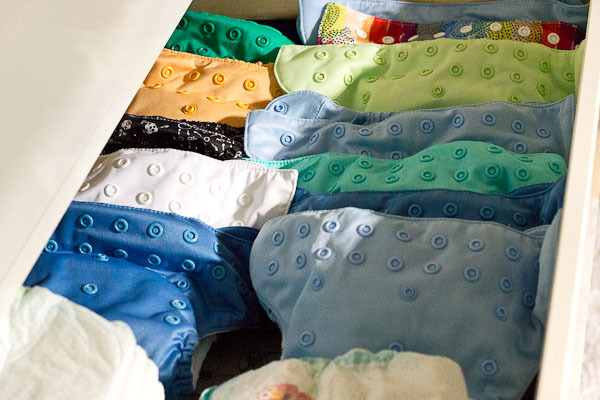 Because we like to wash diapers daily or every other day, a stash of 15-20 cloth diapers work for us. Traditional diaper creams cannot be used on cloth because they ruin the fabric and absorbency of the diapers. 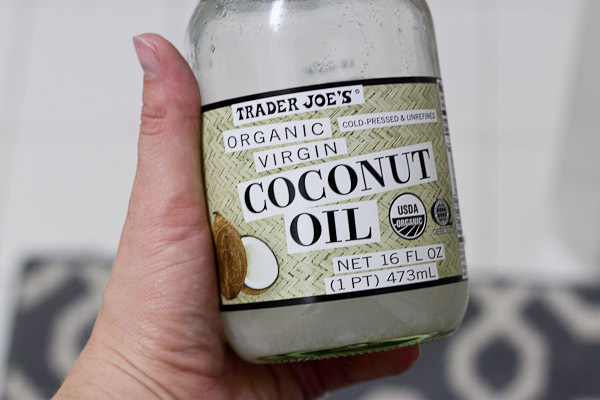 We haven’t had a problem with diaper rash on either of our boys, but we use coconut oil as a natural preventative measure and it smells good! I think cloth is better on the bum and less irritating for many babies. To me disposables have a strange odor, but they do help to keep baby fresh. 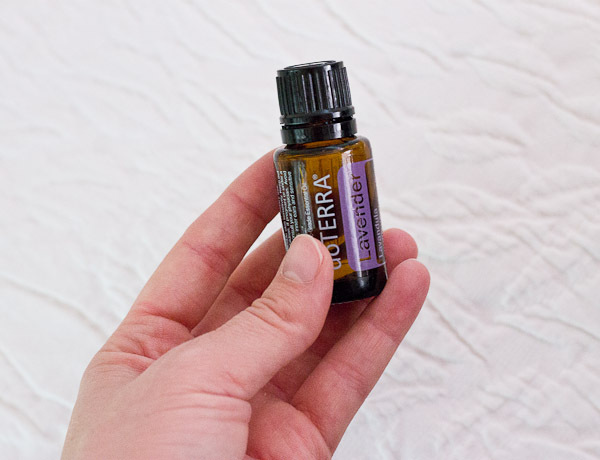 If needed, I’ll use a drop of lavender essential oil mixed with coconut oil on the bum to freshen up. Don’t start right away: If your a new parent, don’t feel the pressure to start cloth right away, give yourself time to adjust to caring for a newborn. Buy some newborn diapers and size ones before you leap into the cloth process (unless you are totally all about it, then by all means). We didn’t start using cloth until 2.5 months. They go trough a crazy amount of diapers the first month or two so we used disposables at that point so that we weren’t washing diapers around the clock. Ain’t no body got time for that. No late night diaper dash: I also love the feeling of “not running out”. Impossible to make a target or grocery store run with your little or didn’t order in time to get your Amazon shipment before you run out of disposables? No problem with cloth, I love not having to purchase diapers every week and getting that feeling of I need to run to the store now before I run out! That’s it! Call me crazy, but I’ve found cloth diapering to be really easy and enjoyable. 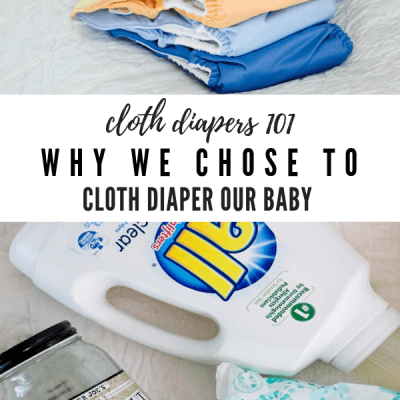 You should also know that I thought I’d be the last person to do cloth diapers, in fact I thought it was ridiculous at one point… but when we learned the impact on our wallet and this easy process I reconsidered. We truly love using cloth diapers! I’d love to hear from you if you have questions or comments on cloth diapering a baby! Does your Buy Buy Baby carry BumGenius in the store? I would love to use the coupons but BG is not available in our store. Yeah, they do carry them! I know you can buy online and can use coupons on there, but can’t get around the shipping.. Maybe go in store to see if they can special order them for you since they don’t carry them… and maybe you could use discount that way? I don’t have kids yet, but cloth diapering is something that’s in the back of mind as I get older. I was allergic to most disposable diapers as a baby (I still have lots of skin allergies to detergent, lotions, etc) so there’s a chance my kids will be too. This sounds like an overall better solution. I’m glad to hear other’s opinions on the subject. I’m so glad you wrote this! I actually discovered that in our area in Canada we can get a delivery service for disposable diapers. They will drop of hospital grade sanitized diapers, and pick up the full and dirty ones. So basically it’s almost like disposables, without the cleanup or washing. AND it’s still cheaper than disposables. They even have different sizes as the baby grows! I’m not one who normally says “for the environment’s sake” but the fact that this option is cheaper and more convenient just screams amazing to me. Yeah– the delivery service is definitely an option. It truly hasn’t been a big deal washing them on our own though. I was a little nervous when we got started but surprised me how easy it was.